KIEV, Ukraine -- Ukraine's Foreign Minister Kostyantyn Hryshchenko will arrive in Russia on March 16 for a two-day working visit, Ukrainian UNIAN news agency reported on Sunday, citing a Russian diplomatic source. 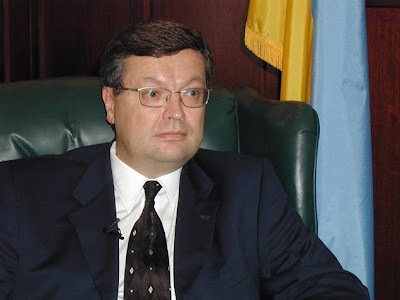 Ukraine's new Foreign Minister Kostyantyn Hryshchenko. The Ukrainian parliament on Thursday approved a new government on presentation from Ukraine's new President Viktor Yanukovych. The 450-seat Supreme Rada carried the decision with 240 votes against a required minimum of 226. During his visit to Moscow Hryshchenko, who worked as Ukrainian ambassador to Moscow before his appointment as the foreign minister, will meet with his Russian counterpart Sergei Lavrov, the diplomatic source said. "After negotiations, the ministers will sign a plan of cooperation between the foreign ministries of both countries," the diplomatic source said. Yanukovych who was sworn in on February 25, succeeding Viktor Yushchenko, a leader of the 2004 pro-Western "Orange Revolution," has repeatedly said he wanted to improve relations with Russia. Yanukovych has pledged to steer a more balanced policy towards Russia than Yushchenko, whose policies, including a bid to take Ukraine into NATO, saw a rapid deterioration in bilateral ties. The new Ukrainian leader also said that "by actively cooperating with each other in all areas," Russia and Ukraine could make a return to the good relations they "always had."